Face it. Life can be stressful. But not when you have some lightly battered premium white-meat chicken by your side. Just grip, dip and go. Wasn’t that easy? Take that, yoga class. 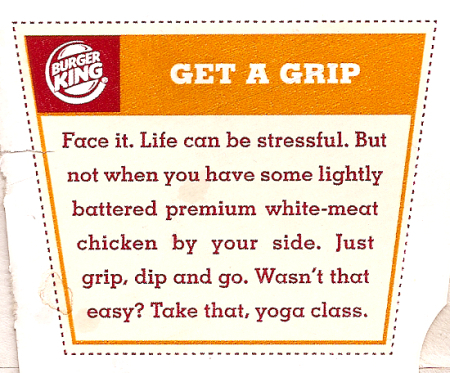 Essentially Burger King is saying that to relieve stress you are better off eating deep fat fried chicken that has 53% of it’s 390 calories coming from fat than to do a yoga class. And if the fat and calories were not enough, they provide 41% of your RDA of sodium. They are trying to convince us that getting almost half of your sodium in one meal (that does not count the fries or anything else with your meal) is less stressful, and presumably better for you, than doing a round of exercise that is perfectly designed for stress relief. I know that fast food joints are not known for their promotion of good health, but to say that you will be more stress free and, implying, healthier by eating the Chicken Fries than exercising seems irresponsible.